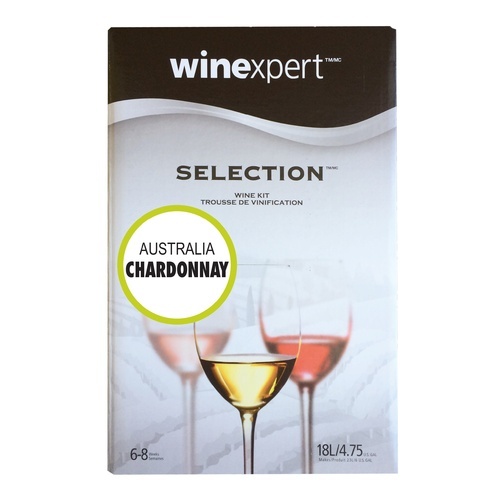 Winexpert's most popular premium wine kits. Country specific grape juice gives these wines exceptional body, flavor, and aroma. Ready to bottle in 4-6 weeks and ideally drunk 3-6 months after bottling. I tried before Australian Chardonnay and it is always my favorite. Made this kit and the Sonoma Dry Creek Chardonnay (also wrote a review of it) at the same time to compare examples of oaked and unoaked styles. This kit does represent the oaked style very well; nice mouth-feel and aroma, and a rich but light buttery taste. I made more variations to the kit recipe than I usually do with kits...but they turned out nicely. Used D-47 yeast (from a starter), fermented the wine at 55-60F, bulk aged for 60 days, and used Sur Lie with battonage for about 6 weeks. Clarification was slow, but it finally settled to brilliance. I recommend this kit. Order was fast and Kit was easy. Fermenting now.